A mental marvel from birth, who used his talents on stage as a boy, Philip Strange is now known as “The Phantom Ace of G-2″ by the Allies during WWI. From his very first adventure, Captain Philip Strange has rooted out only the most bizarre battalions commissioned by Germany in the Great War. When flying coffins circle the air, or severed hands drop from the sky, the call goes out for the Phantom Ace of G-2 Intelligence. For the Allies know that only the so-called “Brain-Devil” and his aides can out-fly the zombie traitors and human bombs, or out-spy fiends like The Mask and the Man with the Iron Claw! When World War I gets weird, only America’s own “Phantom Ace of G-2” has a ghost of a chance against the supernatural slaughter. 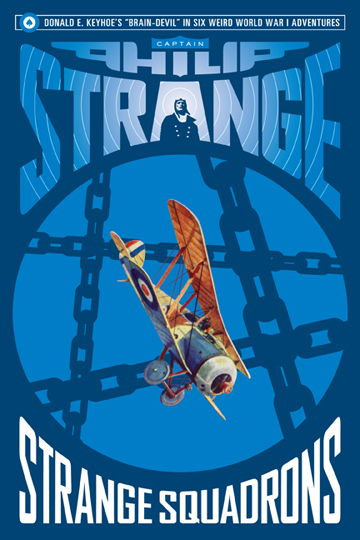 Captain Philip Strange in his strangest cases yet from the pages of Flying Aces magazine!